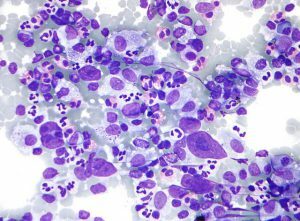 Last week, the U.S. Food and Drug Administration (FDA) announced that it had approved expanding the use of the immunotherapeutic pembrolizumab (Keytruda) to include the treatment of certain patients with Hodgkin lymphoma. Specifically, the FDA approved pembrolizumab for treating adults and children with classical Hodgkin lymphoma that has not responded to treatment or that has relapsed after three or more different treatments. With this decision, pembrolizumab is now approved for treating four types of cancer: melanoma, lung cancer, head and neck squamous cell carcinoma, and classical Hodgkin lymphoma. Micrograph of Hodgkin lymphoma, a rare type of cancer anticipated to result in 1,070 deaths in the United States in 2017. By Nephron (Michael Bonert), via Wikipedia, CC BY-SA 3.0. Hodgkin lymphoma is a rare type of cancer. The National Cancer Institute (NCI) estimates that in 2017 there will be 8,260 new cases of the disease diagnosed in the United States and that 1,070 people will die of it. The vast majority of patients with Hodgkin lymphoma have a form of the disease called classical Hodgkin lymphoma. A feature of classical Hodgkin lymphoma is the presence of large, abnormal lymphocytes called Reed-Sternberg cells in the lymph nodes. In many patients, these cells express elevated levels of the proteins PD-L1 and PDL-2, which can attach to PD-1 on lymphoma-fighting immune cells called T cells, putting the brakes on the T cells and stopping them from attacking and eliminating the lymphoma cells. The rationale for testing pembrolizumab as a treatment for classical Hodgkin lymphoma is that it targets PD-1, preventing it from attaching to PD-L1 and PD-L2. In this way, pembrolizumab releases the brakes on lymphoma-fighting T cells. The approval of pembrolizumab for classical Hodgkin lymphoma was based on results from the phase II KEYNOTE-087 clinical trial, according to Merck, the company that develops pembrolizumab. In brief, the results showed that 69 percent of the 210 adult patients who received pembrolizumab had an objective response for an estimated median of 11.1 months. Of the 145 patients who responded, 46 had a complete response and 99 had a partial response. In this clinical trial, adverse reactions caused 5 percent of the 210 patients to discontinue pembrolizumab treatment and 26 percent of the patients to have treatment interruptions. Fifteen percent had an adverse reaction requiring systemic corticosteroid therapy. Given that the approval centers on response data, rather than overall survival, Merck is required by the FDA to conduct further studies to confirm that the immunotherapeutic improves survival for patients.